The interventions for vector control in Zambia aimed at preventing transmission are the use of long-lasting insecticide-treated nets (LLINs) and the spraying of eligible structures and where applicable. These are implemented within the framework of Integrated Vector Management. LLIN use is a cost-effective way of preventing malaria. Studies have shown that when used widely in a community, LLINs can significantly reduce severe malaria and resulting side effects. Mass campaigns have been conducted every 3 years to ensure universal coverage. Most recently, 10 million nets were distributed nationwide in 2017. LLINs will be prioritized for people living in high burden areas (but in IRS ineligible structures) and to vulnerable groups such as children under the age of five years and pregnant women. Continuous distribution of LLINs will be through channels such as antenatal care (ANC), Expanded Programme for Immunization (EPI) and selected primary schools. Is your organization planning to distribute LLINs in Zambia? Help us coordinate net distribution by keeping us regularly updated on your LLIN distribution plans. Check with us before you distribute. Priority areas have been defined. IRS activities are conducted annually in Zambia to support malaria control activities. These activities routinely include district-level planning and budgeting for targeted areas, assessment of spray structures, training of spray teams, and supervision and monitoring of spray activities. The goal for this elimination strategy is to attain operational coverage of over 90 percent of eligible structures benefitting up to 80% of the population of Zambia, in a timely manner according to transmission season. To mitigate the reported vector resistance to insecticides in Zambia, the World Health Organization Pesticide Evaluation Scheme (WHOPES) approved insecticides will be used in rotation but to be reviewed as per Zambia Insecticide Resistance Management Plan (IRMP). Vector control interventions require support in terms of regular monitoring of vector habits, vector densities, and sensitivity to the insecticides being used. Insecticide resistance of malaria vectors—which is likely to evolve with extensive use of pyrethroids on LLINs, IRS insecticides, and in agriculture—may well prove to be an important risk factor. 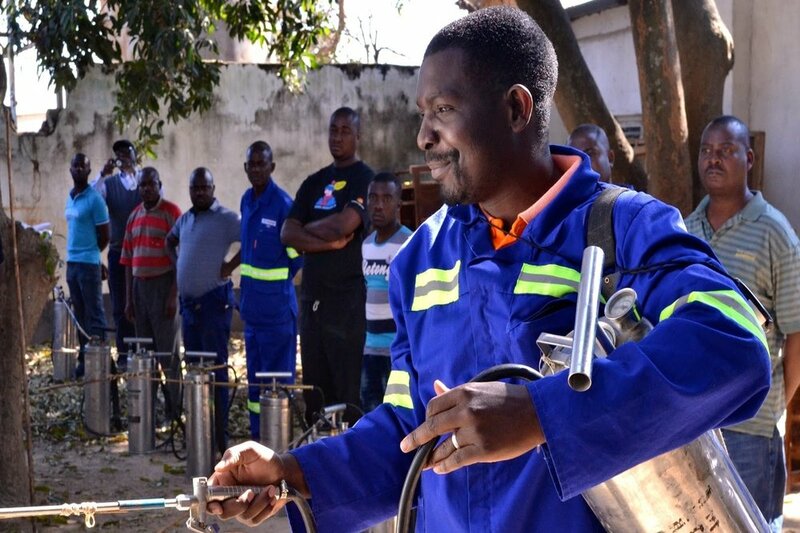 Zambia will ensure that entomologists and vector control specialists are available to monitor and make recommendations if changes in insecticide or other components of the strategy are required, as outlined in the national insecticide resistance management plan.